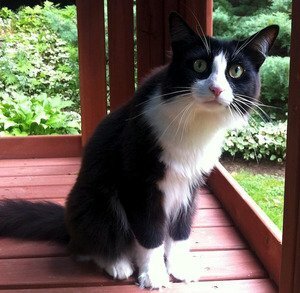 Finally, a refreshing candidate for political office: Meet Tuxedo Stan, a candidate for the Mayor of Halifax in Novia Scotia. Stan is a member of the Tuxedo Party, whose platform is described as a political group devoted to ending the plight of homeless pets in the Halifax Regional Municipality. “Because neglect isn’t working,” is the party’s motto. Stan is a 3-year-old black-and-white cat, who announced his candidacy in June via the Tuxedo Party Facebook page. Since he became a candidate, Stan has been featured a variety of news programs, including on CNN. The cat was interviewed on This Hour Has 22 Minutes. Hugh Chisholm, Stan’s owner and campaign manager, and former veterinarian, who shares many of his candidate’s views — especially the need for cats to be spayed or neutered. Unfortunately, Stan will not appear on the ballot, as cats cannot run for mayor. If Facebook likes determined the election, however, Stan would win by a landslide over the other candidates. For instance, Fred Connors’s Facebook page has 712 likes and Mike Savage has 333; Stan and the Tuxedo Party have 7,500. Stan isn’t the only feline running for high office. In the U.S., a cat named Hank is running for the U.S. Senate against George Allen (R) and Tim Kaine (D).